Have a set of Competencies – I need to be good at something…or various somethings… I will need to learn and have abilities to offer to my family, my job, my world. Be an Alliance Builder – Leaders who are successful understand the importance of creating and building relationships and partnerships…making a bigger impact through mutually beneficial alliances. As important as these two points are, Cloud writes that the most important element to successful leadership is Integrity – which he defines as the ability to meet the demands of reality. Henry Cloud challenged me to evaluate my integrity by looking at the “wake” I leave behind me (like a boat leaves a wake behind as it moves through the water). The wake has two parts: task and relationship, basically what do I accomplish and how do I deal with people in the process? TASK: Are goals being reached? Is there growth/progress in the organization or in my home? Is our mission being accomplished? Are tasks getting completed? Are new ways of doing things being introduced and perfected? Is there a stronger reputation for the work and the ministry? Do we have better systems and processes? Cleaner operations? Are profits being made, finances being raised? Is my house in order, my kids learning new things? …Or does my task wake look like: un-reached goals, disorganization, chaos, inactivity, loss of focus, resources and money loss? Performance and results tell us a lot about a person. Results matter! PEOPLE: Are people more trusting after working with me? Are they more fulfilled as people? Have they grown as a result of associating with me? Do they feel that I encouraged them? Did they learn from me? Are they inspired to be more and do more? …Or does my wake leave people: wounded, hurting, manipulated, angry, feeling put down, devalued, unappreciated and inferior? And the key question: Would they do it again? I am asking God help me grow in my integrity. How about you? 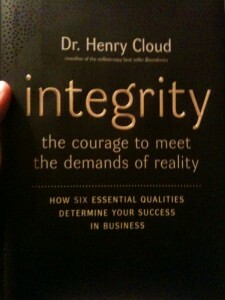 This entry was posted in book reviews and tagged growth, Henry Cloud, integrity, leader, relationships, task by terry morgan. Bookmark the permalink. I visit every day some blogs and blogs to read articles or reviews, however this web site gives quality based writing. Thanks so much for visiting and for your kind words! Great blog Terry. Looking forward to the blogs on the rest of the book.